Great British Dishes: Let's Eat! - Martin's Garage n.a. Great British Dishes: Let's Eat!!! I researched about dishes culture of England, because I heard that English dishes are not as good as French, Italian, Chinese, and Japanese dishes. Is it true? I wanted to know about it, so I read about this and checked many things. The staple food of the U.K. The staple food of British is potato. British people eat potato every day. British potato is very tasty. The popular dishes of potato are “jacket potato” and “chips”. “Jacket potato” is a very simple dish. The way to cook “jacket potato” is only by baking an unpeeled potato in the oven. There are many variations of toppings, for example, butter, cheese, sour cream. British people can eat this at common restaurants. The British potato is bigger than the Japanese one. It’s really big, but British people easily eat it. Another popular dish of potato is “chips”. This is also a really simple dish. The way to cooking is only frying. It often accompanies fried fish. This fish is usually haddock, and this set is called “fish and chips” by British people. This dish is very popular in the U.K. They can eat it at common restaurants and pubs. “If you want to eat delicious dishes in the U.K., you should eat breakfast three times on the day.” This is a famous saying by the writer William Somerset Maugham. British breakfast is very good and very luxurious. 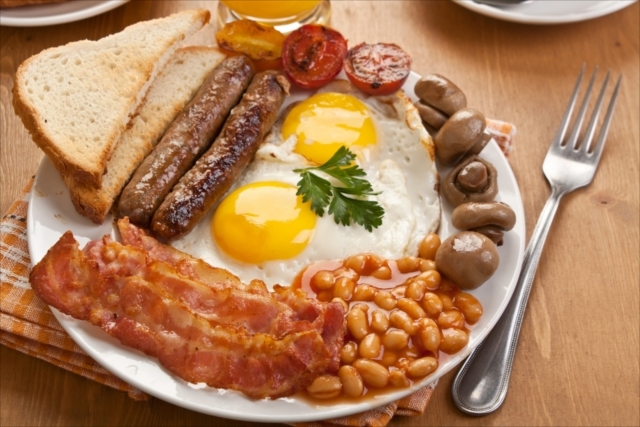 The full-course meal of English breakfast is very big. If you eat all of the breakfast, you can’t eat a lunch (if you are Japanese). There is a lot of things to choose on the menu for breakfast. For example, there is coffee or tea, cornflakes, smoked mackerels, egg dishes, fried bacon, sausages, mushroom saute, baked tomato, potato saute, and various kinds of bread. In the picture below, you can also see baked beans, in tomato sauce. So, breakfast is very heavy, but it tastes very good. English fried bacon is very salty, because most dishes at breakfast have no seasoning. So salty bacon keeps a good balance of the salty taste. I will introduce about good food of London. In the old days, upper-class gentlemen went to a clubhouse and enjoyed English dishes cooked by a skilled chef. There was an especially popular dish. It was turtle soup. It was very delicious. But turtle meat was very expensive. Because turtles died on the journey when they are brought from Caribbean sea, so ‘mock turtle soup’ was made with the head of a cow. The common people enjoyed dishes in a restaurants called “a cook house” or “a chop house”. They were cheap restaurants, and they served eel dishes mixed grills, some kinds of pie, jellied fish of conger eel. What is this strange English food? South and South-East England have productive land and a nice climate. So there is a lot of farm land and many crops are grown. Cherry is a special product in the county of Kent. It was brought to England by the Roman people. There are famous desserts like “cherry bumpers”, “cherry star pudding”. Farmers of Kent eat “cherry pie sundae” when they celebrate harvesting crops. Sussex`s famous dish is “sweet pudding”. In fact, there are many kinds of pudding like that, which are filled meat and fish, mixed apple or syrup. In Cornwall, English people drink tea with scones (called ‘biscuits’ in America), jam (‘jelly’ in the USA) and clotted cream. This style is called “cream tea”. Traditional cream tea is a set of a bread like a dome called “split”, clotted cream and jam. But the latest it is appended a scone. Clotted cream is made from butterfat. It is very thick and yellow. It is used widely for cooking. Cornish ice cream made from clotted cream is very tasty. But it contains many calories. South west country`s chief industries are fishing industry. The famous dish in this place is “star gazey pie”. This pie is filled sardines, and fish`s head sticks out the pie. It looks like the fish looks at stars in the sky. In Somerset, many apples are produced. They are used for many kinds of dishes. There is a drink called “lamb`s wool”. It is a spicy drink which is made from boiled apple and beer. The famous foods in the midlands are Stilton cheese and black pudding. Stilton cheese is made with penicilium. Penicilium is a kind of mould. Stilton cheese is fermented by penicilium. It matches with wine very well. It was created by Mrs. Paulette. Black pudding is a typical local dish of the midlands. It is sausage made from pig`s blood, herb, spice, bread crumbs, and fat. Origin of pudding was a kind of sausages. It is eaten at breakfast. There are many stock farms of sheep. So there are many dishes made from mutton and lamb. Lancashire hotpot is a typical traditional dish. It is made from mutton, lamb chop, onion, and sliced potato. The Fishery prospers very well in Lancashire. So large fish are unloaded from large fishing boats. The fish and chip's origin is Lancashire. 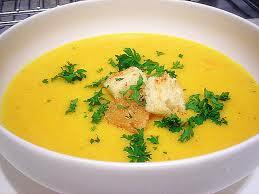 People of the north England eat soup called “potage”. It is thick soup based on barley and added many ingredients. It is a common and traditional local dish. There is a dish called “hindle wakes” in Lancashire. It is traditional dish of Lancashire. 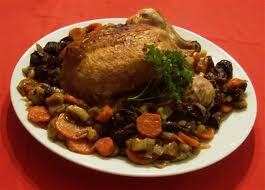 Chicken is filled with bread crumbs, herbs, and prunes. Its face is white, but its inside is black. It makes contrastive colors. I heard that the dishes of England are really terrible. But I understand that this idea is wrong after reading this book. British people don`t have habit of eating out. So we can`t eat delicious dishes of England at restaurants. We can eat it in the home in the U.K. English food is good. If I have a chance to eat British foods, I want to try it.